Memorial Medical Center-Livingston Volunteers Contribute More Than 4,600 Hours of Service, LIVINGSTON, June 16, 2014 - Whether it’s ringing up a purchase in the hospital gift shop or holding the hand of a waiting family member, Memorial Medical Center-Livingston Volunteer Auxiliary members play a vital role in the day-to-day operations of the hospital. Recently, the Auxiliary Volunteers were honored for their dedicated hours of service during the annual Retired Senior and Volunteer Program (RSVP) breakfast hosted by Deep East Texas Council of Governments (DETCOG). Director of the Deep East Texas RSVP Pam Dunn and RSVP Area Coordinator for Polk, San Jacinto, Tyler and Trinity counties Rosemary Frankens honored the hospital's Auxiliary Volunteers for hours served from April 1, 2013 through March 31, 2014. Dunn announced that, overall, Polk County residents logged 787,808 volunteer hours. Thirty-one Memorial volunteers contributed 4,623.75 of those volunteer hours. Outstanding Volunteer Auxiliary members include Gift Shop Manager Shirley Brock who contributed 365.5 hours of service. Chaplain Program Coordinator Mary Summy contributed 345 volunteer hours, and Auxiliary Treasurer and gift shop clerk Myrle McLaurin contributed 328 service hours. Special commendation also goes to the following Auxiliary members for their many hours of service: Jo A. Bechtel, Barbara Benton, Barbara Blackbird, Judy Blackstock, Nancy Brinton, Janis Collins, Lynne Gevirtz, Robert Haigler, Nancy Harrison, Janis Hearn, Kathie Hilton, Cheryl Holsey, Roxie Hudson, Mary Ibison, Carol Jodon, Marlene Judson, Evelyn Kirkpatrick, Mary Lawrence, Myrle McLaurin, Chuck Milner, Pat Milner, Wilda Moore, Petty Peebles, Pat Peoples, Bobbylee Ruskis, Bruce Schweichler, Tommy Smith, Mary Summy, Leah Vogely and James Walrath. The theme of the MMC-Livingston Volunteers is "Lend a Hand - Lift a Heart," a message that can be witnessed daily as the Auxiliary members promote the health of the community through means of volunteer service. Profits from the Memorial Gift Shop, which is operated by the Auxiliary, go toward purchasing equipment for Memorial Medical Center-Livingston. Volunteers enjoy numerous benefits including a uniform furnished by the hospital, flexible work hours, a free meal on the day they work, a free tuberculosis test and free mammograms for women under 65 years old, and a free flu shot. Volunteers must be at least 18 years of age, and they must work a four-hour shift each week. To learn more about becoming a volunteer, call 936-329-8501 or come by the Gift Shop to pick up an application. 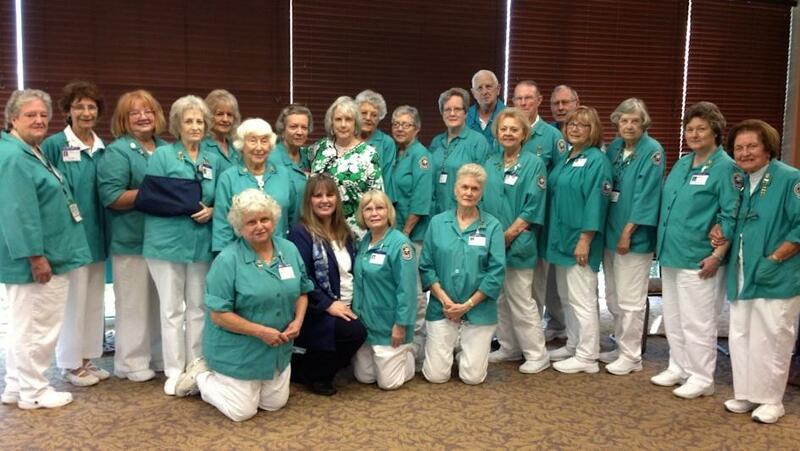 Memorial Medical Center-Livingston Volunteer Auxiliary members were honored for more than 4,600 hours of service to the community at the annual Retired Senior and Volunteer Program (RSVP) breakfast hosted by Deep East Texas Council of Governments (DETCOG).